The other night after my husband came home from a long days work I fed him some of my Crock Pot Chicken and Noodles. While eating it he suggested I make it with beef. Well I thought that was an excellent idea and my creative juices have been turning ever since. This turned out really good and everyone really enjoyed it. 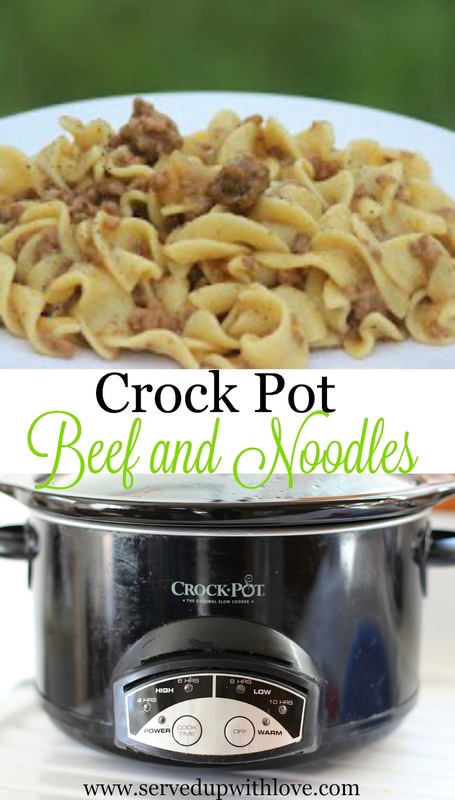 I love the fact that it is a crock pot dish and it is an easy dinner to prepare. School has officially started here this week and I find myself having a hard time finding a groove. That is nothing unusual for me though. It is always a struggle when our routine changes again. So I am on a search to find simple and easy meals that I can prepare quickly on a weeknight. My daughter is in first grade this year and I already know it is going to be a struggle to get her to do her homework. Life is really going to get interesting as she is not a child that focuses or sits still. I am determined to be the best mommy I can and find all the patience I can. Anybody have any to spare that they could throw my way? I decided this morning before I left for work that I was going to throw this together on my lunch break. I took the hamburger out to thaw and when I returned home I got to work on it. If you cook your hamburger ahead of time and freeze you could skip this step. My husband complains when I do that so I freeze it when its raw and cook as needed. I sure could save some time if he wasn't such a pain. Once the hamburger meat is done place it in your crock pot. Pour 3-4 cans of beef broth in, add about 1/4 to 1/2 sliced or chopped onion and seasoning and cook on low for 6 hours or high for 4 hours. I did not have beef broth so I just used beef bouillon cubes and added water. About a half hour before you expect this to be done add a corn starch slurry to make a gravy. Boil your egg noodles until done and add into the meat mixture and stir. This is my very excited 1st grader. She was super tired tonight and went to bed really early. She is getting so big. I just can't believe how fast time is flying. The end of August she celebrated her 6th birthday. Here is my not so happy 11th grader. He was not excited at all to go to school. Did I mention he is taking culinary arts in school this year? He is asking me all kinds of questions and asking for my help. He has said from an early age he wanted to be a chef but I did not think he would actually do it. I am so looking forward to how this year plays out for him. Cook hamburger and drain. Add cooked hamburger to crock pot with beef broth, onions, seasonings and worcestershire sauce. Cook on low for 6 hours or high for 4 hours. Thirty minutes before done add a slurry of cornstarch and water to thicken the sauce. This can also be done with flour and water. Use about 2 heaping tablespoons of cornstarch/flour and cover with water in a cup, stir until dissolved and add to meat mixture and continue to cook. Boil noodles until done and add to meat mixture. Enjoy! This looks great! I want to try it soon. I make this but instead of hamburger, I use a roast! I cook the roast in my crockpot in beef broth until very tender and then add the noodles to it Then I make a slurry to add to the pot to thicken it! I have also made it that way. Always super delicious! At the sake of sounding dumb. How do i make slurry? A slurry is cornstarch or flour and water mixed together. It is used to thicken liquid. Hope this helps.